So which is it, the positive answer or the negative answer? The answer is, without additional information, we don’t know! If (so that ), then is positive, and so . If (so that ), then is negative, and so . 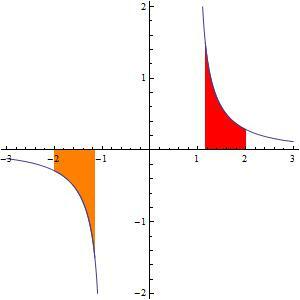 However, the orange signed area on the interval is incorrectly computed using this formula! and the caveat is needed to ensure that the correct antiderivative is used. Indeed, a calculus textbook that doesn’t include such caveats are worthy of any scorn that an instructor cares to heap upon it.